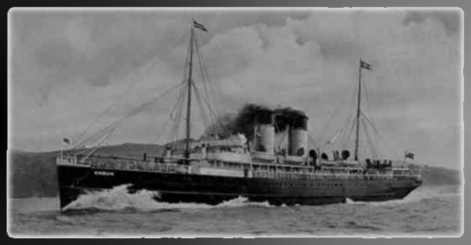 Wm Denny & Brothers of Dumbarton, Scotland, built the SS Anglia, a steel twin-screw steamer on behalf of the London & North Western Railway, which operated on the cross channel Irish services. She arrived in Holyhead on 2nd May 1900. Her 424hp triple expansion engines could push her 329ft along at 21 knots. She was under the command of Captain Lionel John Manning during her short life in the service of the Red Cross, which began in May 1915 when she was requisitioned and converted into an auxiliary hospital ship. At 11.00am on 17th November 1915, the Hospital ship “Anglia” set out from Boulogne harbour for Britain. On approach to the a gap in the Channel defensive system for ships to pass through by No 8 buoy called the Folkestone Gate, at around 12.30 things changed swiftly, when a huge explosion occurred which threw Captain Manning from the bridge to the deck below, the explosion shattered the port side of the Anglia. She had hit a mine just forward of the bridge, one of four mines laid by the German Submarine UC-5. Although reports seem to differ as to the number of wounded on board it was considered to be around 366 of which 166 were ‘cot cases’, many were some of the 60,392 British casualties hideously crippled from the “Battle of Loos”. Of the wounded on board in the two front wards of the ship, it seemed that no one had a chance, within moments the Anglia was sinking down by the bow and badly listing to port. The chaos in those wards immediately after the explosion would have been horrifying. 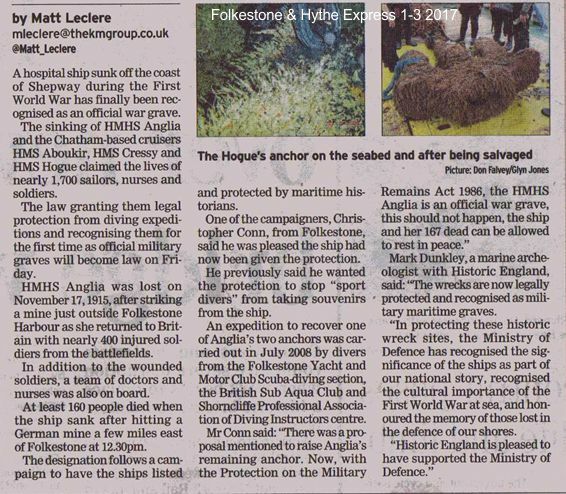 "One moment the men were speeding home across a clam sea, the next they were drowning in their beds". Survivors spoke of nurses sticking by the wounded to the last, of men without arms trying to swim, of others without legs dragging themselves up on deck, even of men who could not walk suddenly finding the strength to stand. 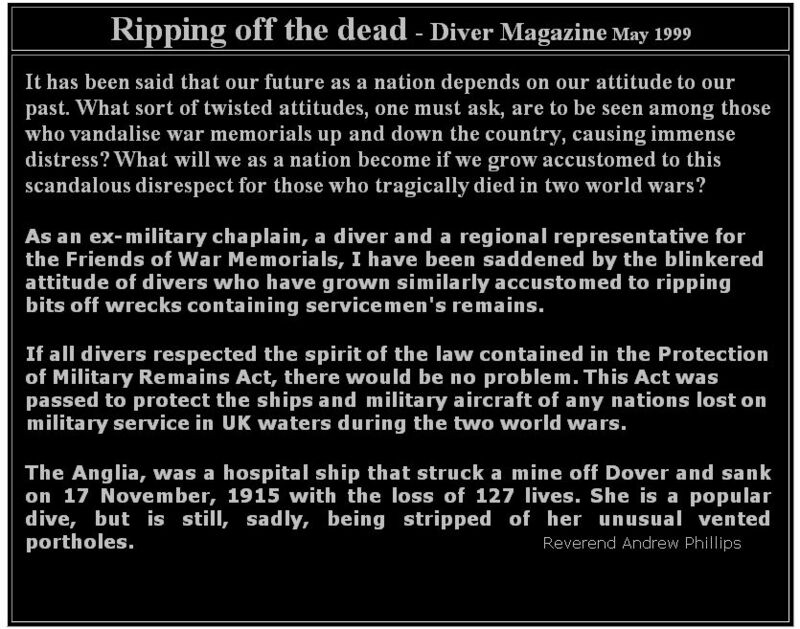 This shipwreck is now protected as an offical mass War Grave. Royal Mail Ship “Leinster”, operated by the City of Dublin Steam Packet Company, and served on the Dun Laoghaire-Holyhead as a mail boat until she was torpedoed and sunk by German submarine UB-123 on 10 October 1918. One of the anchors from the War Grave of RMS “Leinster” was raised in 1996 and put on prominent display on Dun Laoghaire promenade. RMS Leinster’s second anchor was allegedly promised to be recovered and given to Holyhead to be put on display an alleged promise that was not kept. 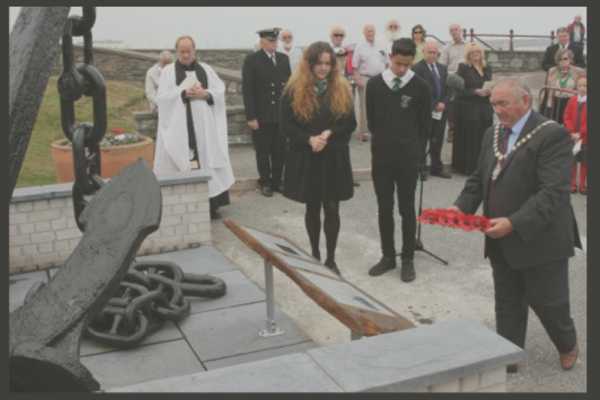 Some at Holyhead decided that they need an anchor to match the one at Dun Laoghaire, so one of the anchors was taken out of the War Grave of the H.M. Hospital Ship Anglia and given to Holyhead Maritime Museum as a replacement for the anchor of RMS Leinster that they did not have.